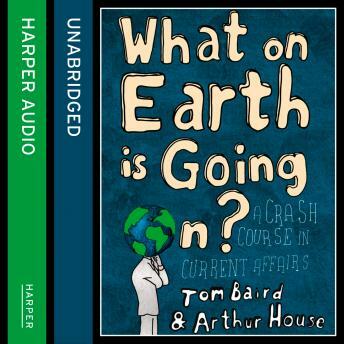 READ BY TOM BAIRD AND ARTHUR HOUSE. The world's a complex and bewildering place. Every day we are bombarded with far information than we can possibly hope to absorb. We don't have the time, energy or patience to process it all and select what's important, and sometimes it's tempting to drop the news section straight in the bin and curl up on the sofa with the colour supplements instead. But there are a lot of things happening in the world that we simply can't afford to ignore. What On Earth Is Going On? fills in the background to the key issues of our times - from Climate Change to the Credit Crunch, Darfur to Devolution - taking the form of an alphabetical glossary that can be consulted at convenient moments. This is a book for the bedside table, the morning commute or the downstairs loo. A rich hotchpotch of world events, current affairs, historical background and amusing trivia, it is a gentle survival guide for people of all ages who wish they knew a little bit more about what on earth is going on.